I wanted to give a brief update on the launch of my new startup law book. The book was launched March 5, 2019 and on the very next day…I left for a family vacation on the other side of the world. So, no real marketing push other than a blog post and a LinkedIn update. 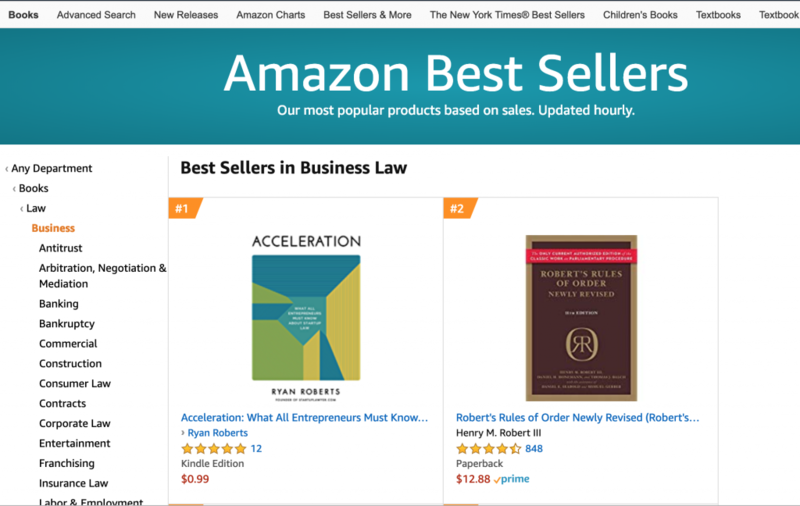 But the book still did well the first week, selling ~700 books and achieving Amazon Best Seller status in various categories like business law, corporate law, law, contracts law, knowledge capital, and #1 new release in venture capital, finance, and law. It took a Roberts to dethrone Robert’s Rules of Order…. I didn’t write the book for #’s or “lists” but certainly was a pleasant surprise. The numbers and lists surprised the publisher who thought I might do 30% of my actual first week total. In the coming months I’ll likely start promoting the book, with a few local events coming up.